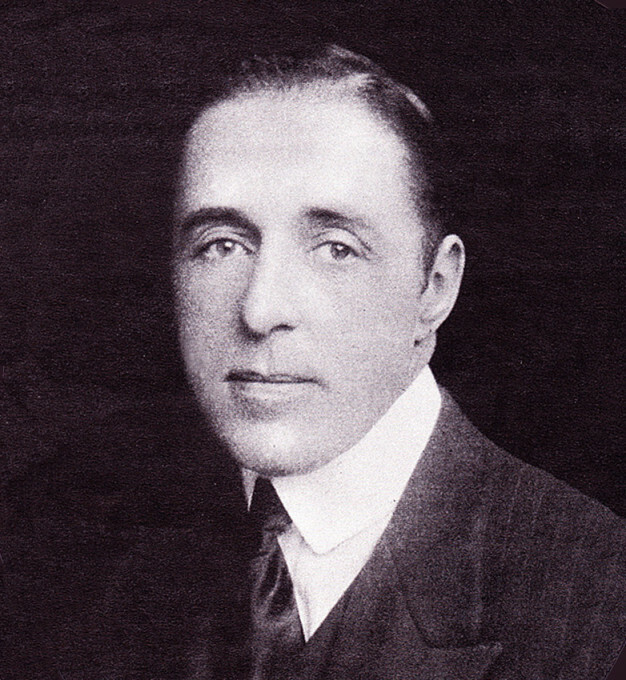 Mrs. Mary Scott Castle’s erratic behavior made headlines both before and after her three-and-a-half year affair with actor Lawrence (D.W.) Griffith. So when she simply vanished from a Manhattan dinner party given in her honor, even her relatives balked at the possibility of a scandal. After a two-day search, they asked her boyfriend to go and notify the police. 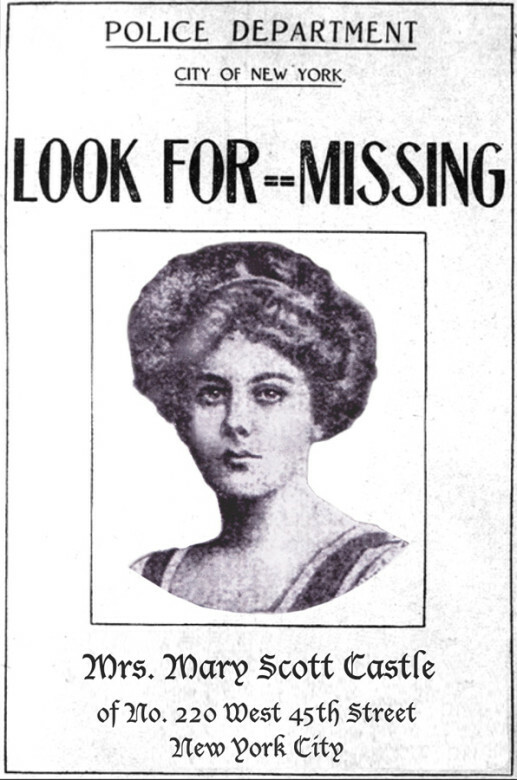 Griffith, 26, was shaken by the way she walked out on him and their vaudeville act in mid-engagement. She had been hospitalized in the past for mental reasons, and he could not help but think she might have killed herself now. The publicity from a citywide manhunt and the offer of a $500 reward brought her home within days. She claimed she had innocently gone off to stay with friends and had no idea why anyone was concerned over her whereabouts. What’s amazing is that after so many months of putting up with her rages and violent outbursts, Griffith still wanted her back. Their relationship (and stage partnership) continued another two years before he was driven to call it quits. He went back to work in the theater for a time, married a different San Francisco-born actress, had his first full-length play produced, and started down a far different professional path. For a full accounting of Mary’s sad, solitary destiny, I direct all readers to William M. Drew’s scholarly 2012 book, “Mr. Griffith’s House With Closed Shutters: The Long-Buried Secret That Turned Lawrence Into D.W.” (Mutoscope Publishing). After the break-up, Mary Scott supported herself as a model, and lived a hand-to-mouth existence in New York for a time. Neighbors found her unpredictable and scary. She encouraged and pursued the affections of a married attorney she had known as a young girl in San Francisco. When he tried to break it off, she stalked him. 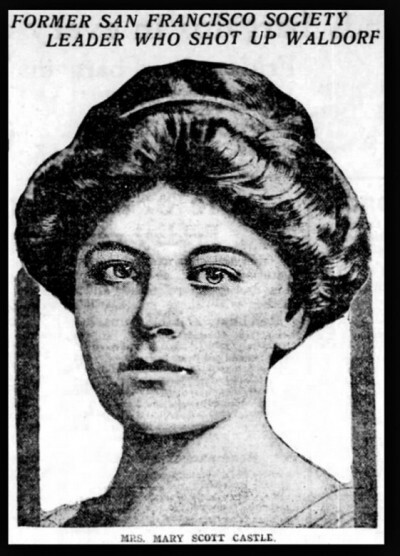 Mary followed him into an elevator at the Waldorf-Astoria and shot him with her .22 caliber handgun. The attorney survived, and six weeks later the assault case was dismissed in court due to the actress’s past history of mental problems and sanitarium stays. After that, Mary took up with the handsome son of a judge who was a former Yale classmate of President William Howard Taft. Young Porter Charlton was fair-skinned with dark, wavy hair. At just 21 years old he was 16 years younger than Mary, though he carried himself with the pride of the chosen and was prone to his own violent fits. Porter quickly found himself a hopeless captive of Mary’s charms and beauty. The couple moved to Europe, relocating from place to place and sometimes being banned from fine hotels for their drunken public fights. Eventually Mary disappeared again. But this time the outcome was sadder. 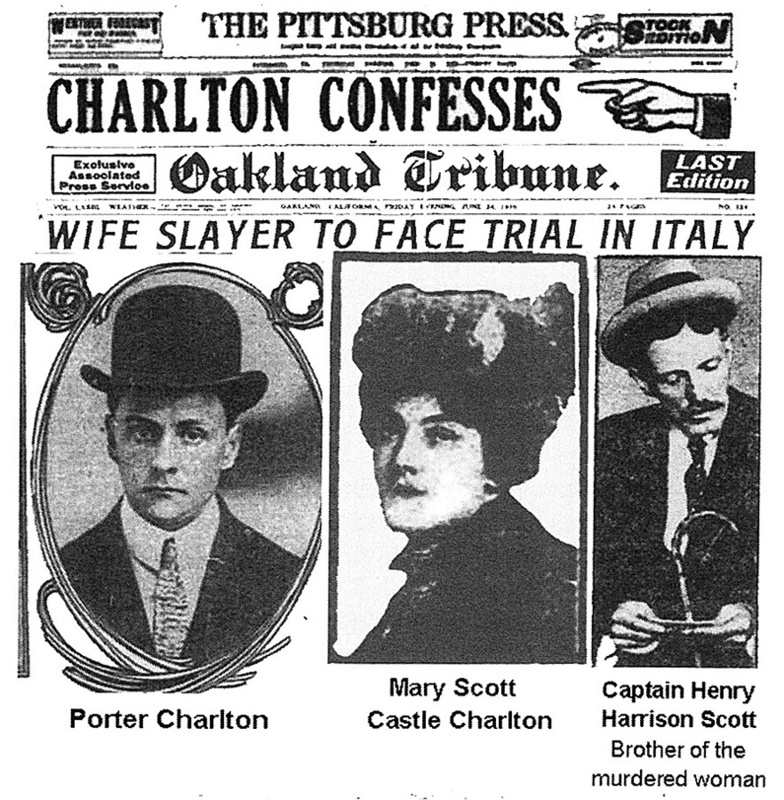 Porter Charlton was convicted of Mary Scott’s murder after her body was found in a trunk dumped in Lake Como. But Porter Charlton served only a few years in prison. Possibly his mental health problems became the focus of his attorneys. In any case, he was soon a free man again, aimless and troubled. He ended up taking his own life in France in 1933. The whole affair was yesterday’s news by that time. Porter’s suicide at age 45 evidently did not merit any attention in the U.S. press. How could Griffith’s salacious past been ignored through the whole sensational murder trial? By then he was professionally known as the man who had turned the Biograph Co. into the very model of the successful motion picture studio. How could his scandalous past have been so totally overlooked? Why was his long relationship with Mary Scott never even brought up? Griffith was not only never questioned about it, his ties to the victim did not come to light until 2012, when film historian William Drew finally brought all the documented pieces together. How could this be? Griffith had no studio press department looking out for him. He had no “fixers” or attorneys twisting arms and bribing witnesses to safeguard his reputation. The explanation, in large part, appears to be pure serendipity. Through all the years of his relationship with Mrs. Castle, Griffith was performing under the stage name Lawrence Griffith (often erroneously reported in newspapers as Griffiths). By the time of Mary’s internationally famous murder case he had moved on to a largely anonymous career as a film director. It was the summer of 1910 before Griffith signed his real family name to a contract, and a few years later before he became known to the world as D.W. Griffith. 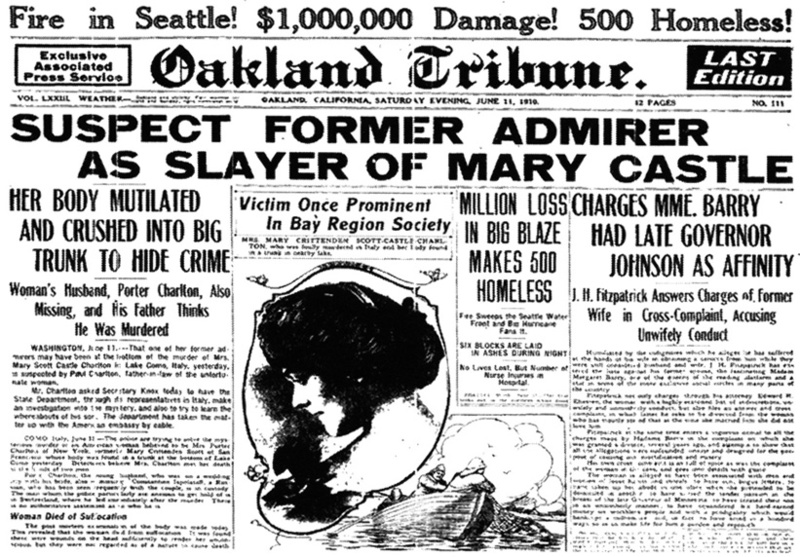 It was Mr. Drew’s premise that the twisted relationship between the future film pioneer and the slain society actress was reflected in Griffith’s work and psychology. To whatever extent either might be true, that author has provided us an additional lens through which to explore the artistry of D.W. Griffith. Watch for my upcoming novel about the early years at The Biograph Co., “The Designated Virgin.” It is a work of historical fiction set in the year 1909 at the dawn of American narrative cinema. An announcement of the publishing date will appear soon. Mary Scott Castle was my Great Grand Aunt. She was beloved by many who did not judge her according to the restrictive and misogyonistic mores of her time… She was a modern woman! The people who knew her in the land where she was murdered highly respected her and mourned her death. Just wanted to set the record straight… What woman with spit and vinegar would not have fought back at the chains and bonds that women were subjected to back then if they could have! I have been studying her life, as well as my many other wild woman ancestors for years…. and I went to the place of her demise… she is in my heart! Wonderful to hear from you and to consider another perspective on poor Mary’s life. Of course you are right about the obstacles women faced from society in those days. You should turn your research and insights into a narrative so that the world can hear her voice! Thank you for writing.